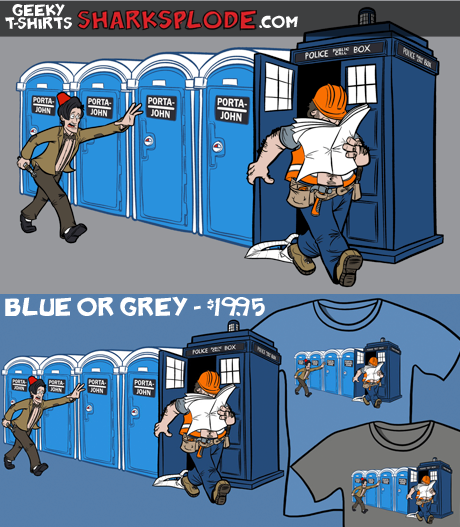 “PORTA JOHN SMITH” SHIRTS ARE UP AT SHARKSPLODE!!! 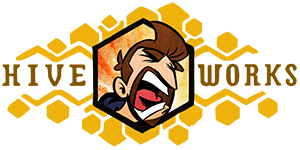 The big giant mega blowout HE Store sale is over, and we are putting the final touches on the new HE store which will soon live HERE. Big thanks to everyone that supported the blowout sale and my apologies to anyone that had to pay unusually high shipping prices. Unfortunately that problem wasn’t sorted out before the sale ended. Yesterday was my wife’s birthday. 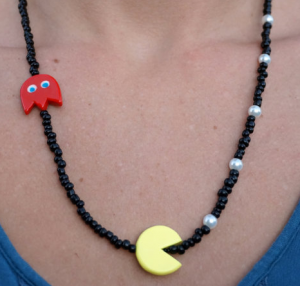 Celebrate it by buying yourself a present from her Etsy store “Science and Fiction.” Check out her her latest geeky creation, a Pacman inspired necklace! I used to work for a landscape company as a book keeper. I was 19 years old, I knew nothing about landscaping and even less about book keeping, but I interviewed extremely well. In fact, I’ve landed essentially every job I’ve ever interview for. Perhaps THAT should have been my job. Getting jobs. At the landscape company I worked for a tiny little man with an ENORMOUS chip on his shoulder regarding his tiny little stature. He was a temperamental little sprite and he took great joy out of bossing around his large, tall, somewhat slow-witted business partner. They had a very “George and Lenny” vibe going on. “The best laid sod of mice and men…” and what not. This little, angry dude also had a sign hung next to his desk and over his mini fridge that said “NO BEER UNTIL 5pm!” Guess what the mini fridge was full of. Day-drunk for him was apparently both a constant struggle and a way of life. COMMENTERS: What are your best and worst experiences with being (or being around someone who is) day-drunk? Was it at a festival, a funeral, at work or at home because you’re an adult, god dammit, and no one’s going to tell you 11am isn’t wine o’clock! Funnily enough one morning after Christmas we wanted pancakes but realized we’d used it all making eggnog the night before. Turns out eggnog loaded with bourbon + pancake mix = surprisingly good pancakes. And gets you slightly tipsy. You can substitute Egg Nog for any ingredient in any recipe and it will usually improve the situation. That’s just science . This may be my favorite ever HE storyline. You’re on a roll, Joel. Hey thanks! I’m having fun. I must say I really like the new tangent. Before, I would skip a few comics when my RSS were too full (900+ posts is way too much to go through without marking a few categories as read), but now I make a point of reading your comic every day. Good job! Beernana is going to be the drink of the next spring break! Best day-drunk.. can’t remember. It’s great just spending the day with friends or on a festival having fun and drinking. Not-so-great were the burn-out days. Being by yourself, avoiding everyone because everything felt like stress and getting drunk to feel better.. except you don’t. You feel worse. It didn’t happen every day, but it was darn-well rotten not being able to cope, feeling frustrated and being too drunk to finish a damn thought. Festivals are the killer for me, sunstroke and alcohol share a similar relationship to fire and gas. Well, A LOT of comics so far only relates to getting drunk ONCE in actual time. It’s all relative. I am the most boring person alive – haven’t been drunk, let alone day-drunk, in years. But when everyone around me is getting stupid-drunk, the last thing I want is to be mentally impaired! Weird, cuz that’s exactly when I feel the need to be drunk. Drunk people are a lot easier to tolerate when you’re impaired. It is good to know someone is thinking with a clear head. My biological father and Step father were both alcoholics and even though they were good men, the drinking kept them from reaching their full potential. They both died young. A lot of people drink beer and it is the beverage of choice in many countries. I guess what I am saying is that getting plastered isn’t a solution for anything. I feel it is wrong to make people, mostly minors, think getting drunk is away to wind down or forget their troubles. It is only my opinion and I am just an ancient flower child trying to share a “little” wisdom. I work graveyards, so my beer 30 is at 7:30 in the morning almost every day…. Day-drunk of the living dead? I’ve always vaguely enjoyed getting sloshed during the day (when not working that day obviously) its especially nice in the summer. I especially like going out for lunch and having a drink and a chat in the pub until dinner and then maybe going to the club afterwards to play darts or some such. When I was in university we used to do that at least once a fortnight sometimes twice a week (we had Wednesday afternoons off you see, I think we were supposed to be doing sport or some other similar nonsense). We once worked out we drank about 200-300 units of alcohol between the 5 of us per session, I’m surprised we didn’t die of liver failure. I had great difficulty with a co-worker once who turned up drunk to work a lot (or was suspected to be doing so, she became erratic after breaks) but no one could work out where she was getting alcohol from. We noticed she always smelled overwhelmingly of cheap floral perfume, turned out she was drinking the stuff, jolly strange way to go about things I must say. I took a French Revolution history class in college with a professor who was a monarchist, aka he thought monarchies should still rule and it was the will of god. He was a Texan who thought the Hapsburgs should rule Texan since it was once part of the Hapsburg empire. The only way I and a few of my classmates could get through the class without screaming was with a mug full of liquor. I would make screwdrivers full of vodka with a splash of orange juice. For the final exam, I was completely drunk on a bootleg White Russian made with the rest of my vodka and Irish cream. I Aced the exam and helped get that worthless idiot fired. It was the only time I’ve been a habitual daytime drunk. Wait… seriously? He taught a class on the French Revolution with the idea that it never should have happened at all? That’s kind of Bizarro-world fascinating. The class was while I was in Austria and the frightening part was that he wasn’t alone in thinking monarchies should still rule. A whole subculture in Austria (and probably other places) exists that believes all deposed royal families should be put back in the throne. The first is the direct descendant of Napolean, the other two of House Bourbon by way of two different family branches. Now I have to find out just how much territory the Hapsburgs ruled! My parents visited their old palace in Vienna, Austria, and learned they basically ruled all of Europe, but Mexico too?! The closest I have to that drinking in class story is when I had to take an American Studies course when I went to SJSU, and we had our last regular meeting before finals in the Gordon-Bierscht microbrewery in San Jose. There we were, giving presentations on various topics, while drinking different types of GB’s original brews! Well when they ruled Spain, Spain still had all the colonies in the New World, so anything within the Spanish Empire between about 1500 to 1700, basically anything that was Mexico and most of Central and South America. Philip II (he of the Spanish Armada, widower of England’s Mary I, aka “Bloody Mary”) ruled about a third to two-fifths of the world in the early 1580s after inheriting the Portuguese throne, although his wars with his rebellious Dutch subjects and former English subjects had already started dismantling the Portuguese empire in the East Indies, and Spanish dominion in the West Indies. And the professor was an idiot. The colony of Tejas was under a Hapsburg king for maybe fifteen years before the Bourbon succession. And the Austrian branch of the family *never* had a claim on the Spanish possessions in the New World. Woke up around noon on a Saturday, opened the fridge, saw a beer, and thought, “Why not?”. Skip ahead ALL THE BEERS later to me waking up laying on the dog bed in the dark and thinking, “I don’t remember going to bed here last night.” I checked my phone and saw that it was 8 o’clock… in the evening. I’d managed to drink myself onto the floor in a few hours and “nap” the day away. The first is from college. My room mate and I picked up a bunch of little packets of slushy mix that Kool-Aid made. i don’t think they’re made anymore, sadly. We’d mix them with vodka and freeze them in solo cups and then wander around campus eating boozy slushy and nobody knew. NOBODY KNEW. Stealth drank. I made some absolutely incredible bread pudding, studded with orange and bourbon soaked raisins, with an amazing bourbon sauce that was… very, very strong. So my parents came over and I made scrambled eggs and bacon and this intensely fantastic bread pudding and coffee and we all got breakfast tipsy off the bourbon sauce. There is a horse race in Australia called the Melbourne Cup, AKA ‘the race that stops a nation’. It’s held on a Tuesday, around lunchtime. Almost every office stops for the race and there’s sandwiches and champers or beer. I learnt early on not to send emails after Melbourne Cup Lunch – there is a risk that you’ll piss off soemone who you really don’t want to piss off. Melbourne Cup, Geelong Cup and Ballarat Cup are all occasions that have got me very day-drunk! II can’t count the number of times I’ve been day drunk! I’d have to say my favorite is water parks and theme parks. We would carefully unscrew lids off water bottles so that little ring would stay attached to the cap and pour in any clear Booz we wanted then re-seal them. Most parks let you take in water and not much else so we took full advantage of their naiveté. There’s never a bad time to have a drink. Once in college a buddy and I mixed up 3/4 of a gallon of strawberry daiquiri and took it to afternoon classes to share with our fellow students. After three classes I know we were definitely feeling a good buzz–buddy swore I was day drunk but I didn’t think so. Last year, me and a friend mixed up White Russian and put it over cereal (Cinnamon Grahams, to be precise) to go to an 9AM lecture with breakfast after a heavy night of drunken Risk. The lecturer didn’t realise that the milk in the tupperwares…wasn’t. Then we went home and did it again, until about three in the afternoon, when we both passed out. Taste of Chicago, swigging bourbon with my best friend, then stumbling around the festival, demanding that our tickets be turned into tasty food things. Everyone’s favorite: the Office Christmas Party. Except I was working in a theater, and the party started at 11am. We drank during the “awards ceremony” at the theater, drank in a party bus on the way to a restaurant/arcade, drank while playing ski ball and Pacman, then drank in the party bus on the way back to work. Best. Party. Ever. One of the accountants had to call his son to pick him up from work. The only downside: being a theater the real work actually started at 5pm. I’m pretty sure I didn’t sober up until intermission. While I have no day-drunk stories to relate, I want to say that I think this is one of your finest comics, Joel. Something about the pacing of the puns, juxtaposed against the way you’ve drawn Eli on the floor… it’s still making me chuckle just thinking about it! Tags: alcohol, beer, drinking, drunk, Eli is drunk, Storyline: Who Is Your Daddy And What Does He Do? Posted in Uncategorized and tagged alcohol, beer, drinking, drunk, Eli is drunk, Storyline: Who Is Your Daddy And What Does He Do?.